Modern life is filled with tons of great technology, but many of those modern conveniences actually increase the stress in our lives. Though most people can’t go tech-free because of the requirements of their jobs or managing their personal lives, there are ways to use technology to improve your state of mind. If you suffer from anxiety or find stress getting the best of you, you may struggle to find time to set aside for a regular meditation practice. 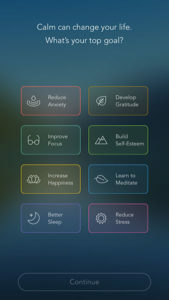 Instead, you can utilize relaxation apps on your iPhone or iPad to help meditate and calm your mind. 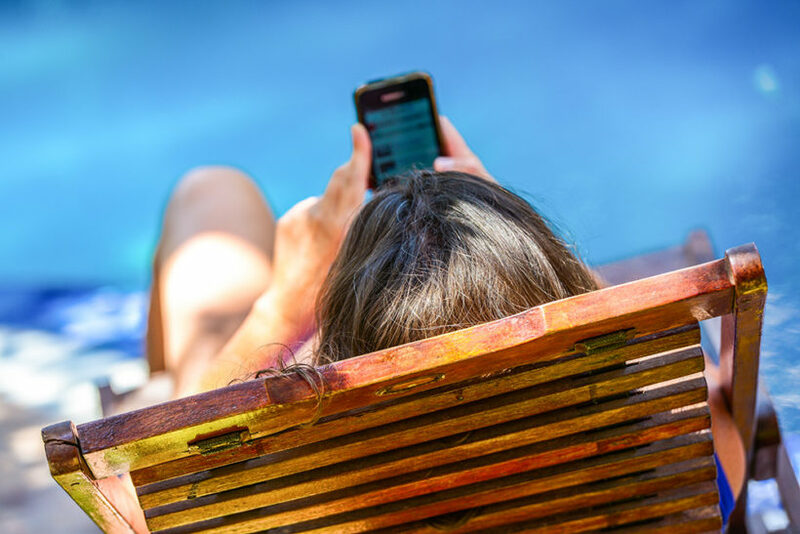 For this article, we’ve rounded up some of the best iOS Apps for relaxation and mindfulness. These apps will help you make time in your day for mindfulness and relax your body in mind when you’re feeling stressed and overwhelmed. The best thing about these relaxation apps is that they can be used anywhere, helping you turn any space into a meditation space. So if you’re stressed at work or stuck on the train during a hectic commute, you can put on headphones and enjoy a little relaxation. Check out our recommendations below. If you’re brand new to meditation and mindfulness, you probably don’t want to just dive right in to guided meditations. Stop, Breathe & Think will take you through the process of learning about meditation, getting in touch with your emotions, and improving your practice. When you first launch the app you can go right into “Learn to Meditate,” which will give you a crash course in meditation and mindfulness. After that, check in under “How Are You?” which asks questions about how you’re feeling physically, mentally, and emotionally. The app then recommends guided meditations based on your answers to help you in the moment. 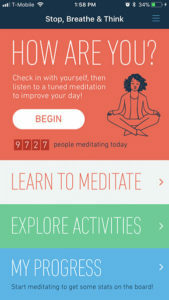 If you don’t want a guided meditation, the app features a customizable meditation timer and a breathing timer. If you’re looking to build a meditation habit, this relaxation app tracks your check-ins and meditations, as well as your answers from your “check in.” This helps you see your personal progress and improvements and helps you form a meditation habit. It also syncs with Apple’s Health app, so you can keep track of all of your fitness and health data in one place. This is a great option if you want to relax and build a meditation practice as a beginner. This app is also good if you have meditation experience but struggle to make a habit out of it. The app is free to download, though there are additional purchases available and a “Premium” version. If you’re dealing with a lot of stress in your life in addition to anxiety, Pacifica is the relaxation app your should consider. 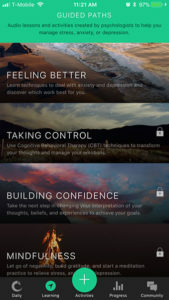 Designed by pyschologists and based on Cognitive Behavioral Therapy, the app focuses on tracking mood, health, and thoughts. This helps you keep tabs on your mind and also helps the app guide you. In addition to the psychological focus, Pacifica also has a meditation library with a variety of guided meditations to help manage stress and anxiety. If you need more support, there is also a Community of other users that you can connect with. When you first set up the app, it will ask you want goals you want to focus on (similar to when you start with a new therapist). You can select options like “Decrease Anxiety,” “Practice Meditation,” or “Positive Thinking,” as well as other health and social skills. Daily reminders will help you record your mood each day. The app will then suggest activities to do to help work toward your goals. On my first day, Pacifica suggested spending time on a hobby to improve my health, complete a thoughts entry, and add an uploading picture or quote to my hope board. The app is free to download, but they do charge for “full access” to use all of the guided paths (audio lessons and guided meditations. You have to sign up for a free account to use the app. If you want to focus on guided meditation for relaxation, Headspace is the top iOS app available. Headspace focuses on teaching you how to meditate and be mindful, targeting specific areas of improvement selected by you. If you’ve never meditated before, the app has a built-in introduction video to teach you. 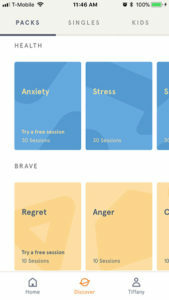 The app starts with a 10 day program to help you become more mindful. Once you’re in you can try packs, which are groups of sessions with guided meditation targeting things like communication, focus, creativity, and self-esteem. They also have singles, which are one-off guided meditations that target a variety of situations, like taking a break at work, waking up in the morning, or going to sleep at night. The guided meditation library in the Headspace app is very extensive and can cover the needs of most users. They even have a section of meditations for kids divided by age group so you can help your children be more mindful and develop meditation habits. For the Apple Watch, the Headspace app provides two exercises to help calm your mind when anxiety and stress have it spinning out of control. One is an SOS guided meditation that helps you focus on your breath and calm a frantic mind. Touch has you touch the screen for 30 seconds, which is an easy way to focus your mind anywhere. The app is free to download but charges a subscription to access their full library of guided meditations. Calm is very similar to Headspace, offering you a variety of options to reduce anxiety and improve sleep quality. When you first sign up, you can customize the app with a top goal, including options for learning meditation or improving focus. After setting up your account, you’re immediately greeted with a peaceful mountain scene and calming nature sounds. The meditation programs are of varying lengths, featuring a guided meditation to complete each day with a specific goal of gratitude, sleep, or happiness. If you don’t want to meditate but still want to calm your mind, the app has relaxing music for a variety of scenarios like drifting off to sleep. The one thing that really sets Calm apart from the other apps is their focus on sleep. They have a unique feature called Sleep Stories, audio that you listen to which helps transition your mind from the bustle of daily life to a peaceful state allowing sleep. Calling back to childhood when your parents lulled you to sleep with a story before bed, these stories lull you to sleep with relaxing narration, calming images, and soothing sound effects. You can choose from a variety of categories including fiction, non-fiction, kids, and even ASMR stories. This section of the app is great for people with anxiety and insomnia. Apple Watch app gives you access to the Daily Calm, a daily guided meditation that will help you build a meditation habit. The app is free to download but does require a subscription to access the full library of features and guided meditations. If you don’t want to do guided meditations and are looking for an app that offers quicker exercises to help you relax, you should try the app Pause. Based on the principles of Tai Chi, they’ve designed a patented system to help you relax anywhere at anytime. It uses mindful touch to calm your mind and relax you. 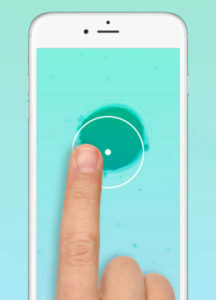 The app gives you a visual where you press your finger and slowly move it across the screen. This simple action helps relieve stress, focus your mind, and help you relax. The app is easy to use anywhere, at any time. People use it at the office, on their commutes, or in bed before they sleep at night. It’s a great approach to meditation and mindfulness that you can do with no training. If you don’t think you need a full-on relaxation app, consider trying a mindfullness bell app for meditation which can help you stay focused during your practice. Looking for more technology to help with your meditation practice? Check out these meditation and stress trackers.